A wonderful counterpart to Ronald Wright’s What is America? 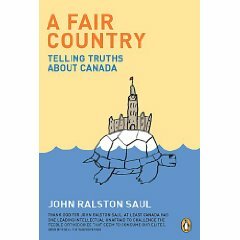 is John Ralston Saul’s A Fair Country which tells us a far richer story about who we are as Canadians. Growing up, I developed two impressions of the aboriginals. The first is that the Europeans came, settled Canada, and unfortunately brought with them new diseases that wiped out most of the native population. The second impression that came much later was realizing that the Europeans exploited the collapsing Indian population and contributed to what was a genocide. While both stories have some truth in them, Saul’s book takes us further back in history before the pity and the superiority complex settles in to when these early European settlers could not have survived without the aboriginals. Marrying an aboriginal was considered to be marrying up because of the many advantages of food and social networks it afforded. It should be no surprise then that the Europeans were in fact “civilized” by the local population. How did this intermingling gives us the foundation for an immigrant nation? How might we once again draw from the best of our cultural roots to guide us today? And what parts of our mythology is best left behind as being unhelpful in a global world? If you have a chance, download Saul’s 2009 UBC-Laurier Institution Multiculturalism Lecture below. The link will expire eventually, so act quickly! This is a book I’ve been wanting to read for awhile … ditto ‘What Is America’. I’ve a few other of Saul’s books & found them to have fascinating premises. I just finished this book! Incidentally, I did read it right after ‘What Is America’. The two books do make a fascinating duo. ‘A Fair Country’ really makes a compelling read on leadership in Canada when Saul’s premise of a Metis civilization – and the loss of that – has lead to the lack of confidence and exploitative colonial mindset displayed by conventional leadership in Canada; in large part because we don’t know, or have lost sight of, where we came from, who we are and inevitably, where we are going. Watched a Bill Moyers interview recently where he quoted Joseph Campbell: “If you want to change the world, change the metaphors.” Part of that is knowing your true history, stories & myths – thus knowing yourself & civilization. That brought me back to Saul’s book. Previous PostPrevious Read Your Social Contract Lately?